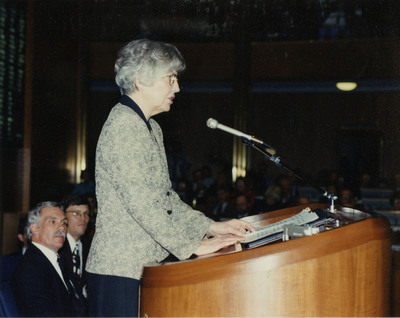 "Addressing the North Dakota Legislature"
Rosemarie Myrdal addressing the North Dakota Legislature. Sitting behind her is Governor Ed Schafer. Prior to being elected North Dakota's 30th Governor, Ed Schafer unsuccessfully challenged North Dakota Congressman Byron Dorgan in 1990. Two years later, Schafer, a Republican from Bismarck, won the gubernatorial election and served as North Dakota Governor until 2001.